The City of Fountain was voted America's Millennium City and 2002 All-America City and is located at the base of Pikes Peak, part of the great, bold, rugged Rocky Mountain Range. Fountain has all the amenities of urban living at its doorstep, yet is still a place where people can enjoy the benefits of neighborly living in a small town atmosphere. Business and industry are flourishing. Living conditions are excellent. Civic leaders and citizens alike are pioneering new ways to bring measured growth and lasting prosperity to this peaceful Colorado Valley. The quality of life is further enhanced by people seeking an increased healthy and invigorating lifestyle. The Fountain Valley boasts an average of more than 300 days of sunshine annually and consistently low humidity. Here you can enjoy long stretches of sunny weather, mild temperatures, clean air, and "Indian Summers." Population trends from the last ten years and future projections indicate the more and more people are choosing to live in Fountain. Fountain is growing at a faster rate than both El Paso County and the State of Colorado as a whole. Fountain's population, and that of El Paso County and Colorado, is comprised mostly of working age adults between the ages of 20 and 64. Fountain Valley includes the communities of Fountain, Widefield, and Security, Colorado. These communities are located approximately ten miles south of Colorado Springs and thirty miles north of Pueblo along interstate I-25 at 5,546 feet above sea level, residents enjoy the scenic view of Pikes Peak. Fountain is a city in El Paso County, in the Colorado Springs metro area. The community is in the Mountain Standard time zone. Fountain is located directly off of Interstate 25, a one hour drive by car from Denver's International Airport or a 20 minute drive to downtown from the Colorado Springs Airport. Shuttle service and ground transportation is available at both airports. The Colorado Springs airport serves 9 airlines with non-stop flights to many major hub cities, with easy connecting flights to destinations all over the world. The area is serviced by Springs Transit. They offer van, shuttle and bus service to the greater Colorado Springs area. 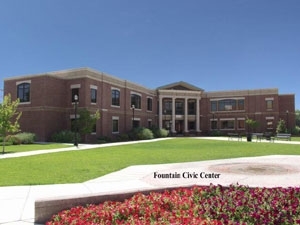 The city of Fountain was established in 1859 and got its name from nearby Fountain Creek, named by early French explorers La Fontaine qui Bouille, "the springs that boils.” Security was established by American builders in 1953 and was named to reassure prospective home buyers. Developer Jules Watson developed the connecting Widefield area in 1965 and chose the name to express the concept of open space. The Fountain town site was chosen by early settlers in 1859 along the banks of Fountain Creek, as the creek afforded the scarce resources of water and abundant vegetation in an area otherwise devoid of fertile growth. The site was also long familiar as a crossroads, where Jimmy Camp Creek joined Fountain Creek, linking the Cherokee Trail to the Old Santa Fe Trail. These paths served native Indians, explorers, trappers, and gold-seekers during the years preceding pioneer settlers. Settlers Fountain introduced a way of life unfamiliar to this the fertile valley, they replaced the seasonal encampment by bands of nomadic Indians like the Ute, Arapaho, and the Cheyenne. The nature of the landscape would change from the grazing land of cattle, from uncultivated lands to irrigated agricultural, farmlands, and to settlement. What would successfully shape the town of Fountain's development was its ability to serve the region as a centrally located supplier for area cowboys, ranchers, farmers, and for prospectors on their journey to and from the gold fields. Industries such as dairy farming, cattle-raising, truck farming, and fruit and vegetable production all thrive in the Valley. Fountain also prospered in the 1870's as a railhead shipping point for the area's cattle ranchers. 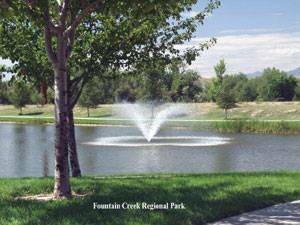 Fountain Creek itself was, and remains, a major catalyst in the growth and evolution of the town. It supplies the town with a water source for irrigation and provides for wildlife and lush surroundings. Fountain was incorporated as a town in 1903, and remains as one of the oldest incorporated towns in the Pikes Peak region.